Bill Webb is a native Houstonian who grew up on the Northwest side of Houston. Many of his boyhood days were spent hunting in the wooded areas of South and Central Texas with his father. This is where he developed a fascination and love of trees. After graduating Reagan High School, he spent the next four years in the U.S. Coast Guard stationed in South Louisiana and Galveston, Texas. During this time he attended the Damage-Control school at Groton Con where he received formal training in acetylene and oxygen welding. He graduated from the University of Houston and was employed as a safety inspector for an insurance company. His interest in creating art increased about this time. 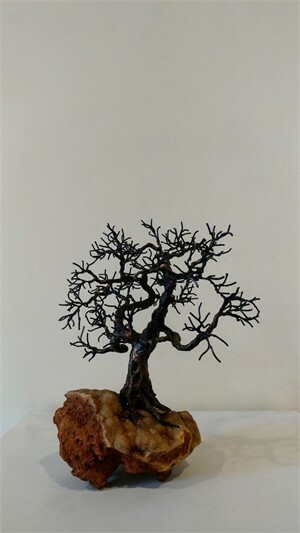 In the mid-1960's he had an idea to produce a 7' metal tree for his patio. The plan was to make a 2' model using an oxygen and acetylene torch and steel rods but, after completing fifty percent of this 2' tree the 7' tree was not needed. 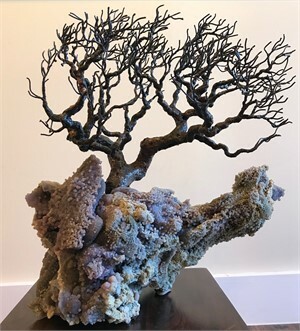 This one tree he created over forty years ago spawned an entire portfolio of metal trees with handmade birds and bird nests with eggs in them that has become his trademark in the Texas art scene. Bill Webb is a native Houstonian who grew up on the Northwest side of Houston. Many of his boyhood days were spent hunting in the wooded areas of South and Central Texas with his father. This is where he developed a fascination and love of trees. After graduating Reagan High School, he spent the next four years in the U.S. Coast Guard stationed in South Louisiana and Galveston, Texas. During this time he attended the Damage-Control school at Groton Con where he received formal training in acetylene and oxygen welding. He graduated from the University of Houston and was employed as a safety inspector for an insurance company. His interest in creating art increased about this time. In the mid-1960's he had an idea to produce a 7' metal tree for his patio. 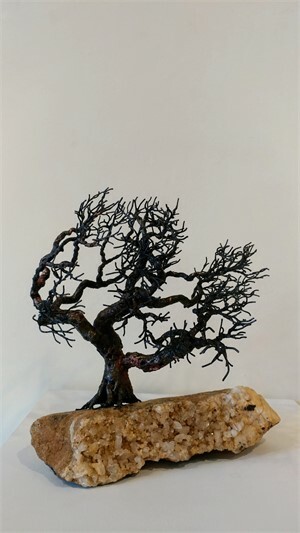 The plan was to make a 2' model using an oxygen and acetylene torch and steel rods but, after completing fifty percent of this 2' tree the 7' tree was not needed. 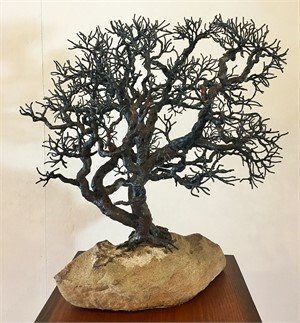 This one tree he created over forty years ago spawned an entire portfolio of metal trees with handmade birds and bird nests with eggs in them that has become his trademark in the Texas art scene.